iPhone lovers there is a good news for you, Apple has recently made an announcement to launch a new Operating System Sierra for Mac computers. Now it’s time to say good bye to older macOS (X 10.11 El Capitan) and get ready to welcome latest macOS Sierra. 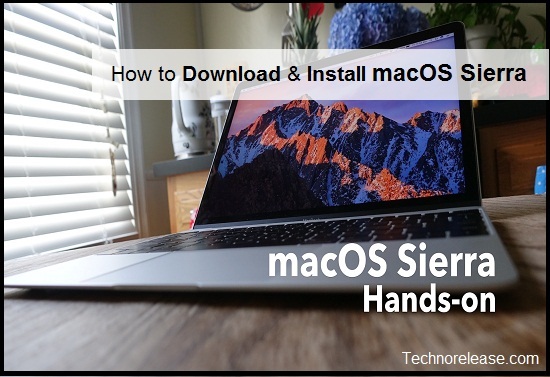 There are several new features has been added in this Operating System and if you are keen to know how to install macOS Sierra much about them, keep reading this article. The macOS Sierra downloading procedure is pretty much simple but there are some certain points you should take care about before to start the procedure. Go for full backup before to start installing macOS Sierra because I feel each and every data stored in your system is important. So if you want to backup your full data try Apple’s Time Machine. Step 1- Choose a new hard disk to connect your external hard disk with your Mac PC. Step 2- When you will go for backup your data in the drive an alert of Use as Backup Disk will show up on your screen. Step 3- But if for any reason, alert didn’t show up, Go to System Preference > Time Machine and then click on Select Backup Disk option to backup your system data to the external hard drive. Step 4- Turn your Time Machine ON. Moving on you’ll find a progress bar will show up in the machine’s preference pane. Now wait for downloading get completed and now get ready for the installation. After the successfully completion of backed up, now your macOS Sierra is ready to install. Go to Apple’s App Store and type macOS Sierra in the search box. A macOS Sierra will appear on screen, touch the ‘Download’ button. Now, enter your Apple ID, password and tap on the ‘Purchases’ tab. After this your downloading process will start. Wait till the installation is completed. Now, once the installation is completed, an installer option will show up on your screen. Just click on it and then within some minutes the OS will be completed. Congratulation, your macOS Sierra is successfully downloaded as well as launched. Now enjoy the latest Apple macOS Sierra on your Mac computer.